The NAR reported that the median US existing home sale price for sales that settled in July was $234,000, which puts the annual inflation rate for house prices at 5.6%. That’s softer than the June closed sale price inflation rate of 6.5% but still way above what the BLS is recognizing for the housing inflation component of CPI, which they are now plugging at 3% for a 41% weighting in Core CPI. The NAR data represents sales that settled and were recorded by county governments in July, but generally took place in May on average. At the same time, Redfin has released data collected from MLS services in the 55 largest US metropolitan area for current contract prices in July. Unlike the lagging NAR data, this is real time market data released within a few weeks of the end of the month. Their data showed July contract prices rising by 5.1% year over year to a median sale price of $278,653. This was stronger than the 4% year to year gain seen in June contracts. The NAR data next month will reflect the MLS June contract price data. July contract prices will show up in the NAR’s October release. The widely reported Case Shiller Index to be released next week, will only show average contract prices for March. July contract data won’t be reflected in Case Shiller until December. In addition, its smoothing methodology and the inclusion of repeat sales only further suppresses and slows the Case Shiller Index. Its methodology often leads to dangerously misleading conclusions. It is why it took Robert Shiller was nearly 2 years late in recognizing that the housing price crash had bottomed in 2011. While Big Media focuses on Case Shiller it ignores the far more sensitive and timely sources of information that are available. Most astounding is the fact that even the Wall Street Journal, which is the PR organ of the Rupert Murdoch owned Realtor.com, emphasizes the Case Shiller data while refusing to report the accurate current real time house price data to which they have total access. If Murdoch and his press release repeating minions at the WSJ wanted to keep the public informed, they could easily present aggregated real time housing price data via Realtor.com. Yet they refuse to do so. 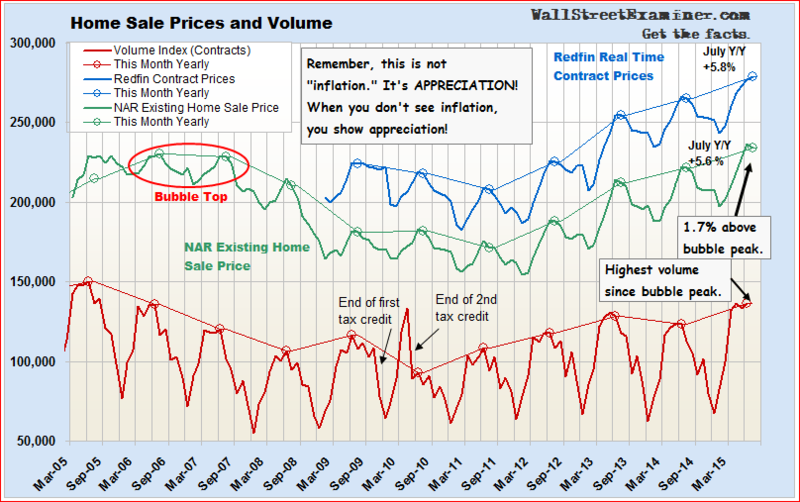 The emphasis on the lagged suppressed Case Shiller data and refusal to report the actual real time data which it owns, is tantamount to a fraud on the public. Unfortunately this is what the public gets from a man and an organization whose sole purpose is to manipulate investor and public opinion. Fortunately, we do have access to at least part of the data on a minimally delayed basis. Housing inflation, while slower than in 2013, continues to rage on. 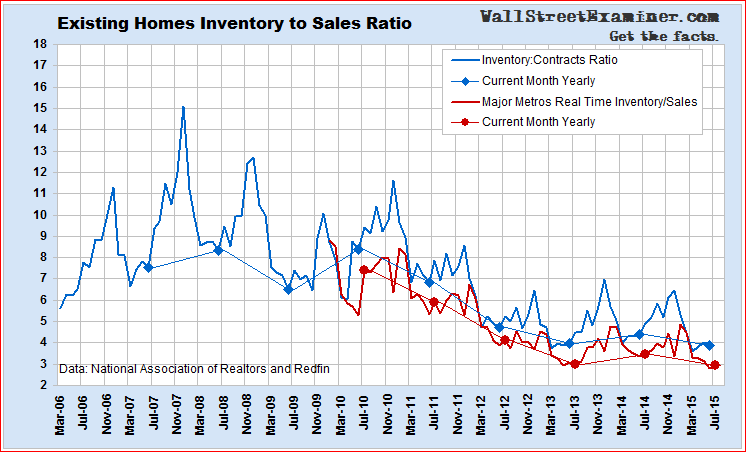 The housing market has a massive problem, in low inventories against near record purchase demand. Sales volume is running at the highest rates since the top of the housing bubble in 2005 and 2006. 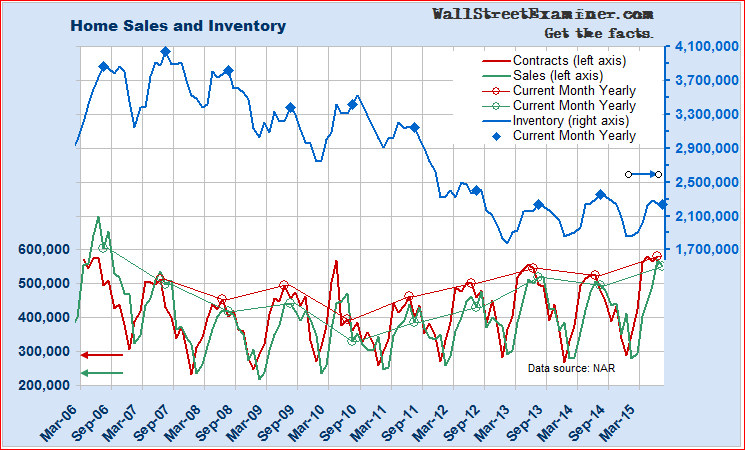 Inventory in the market is at record lows. Both the NAR lagged data for the entire US, and the real time market data from Redfin for the 55 largest US metros show the inventory to sales ratio is at a record low. These are the conditions which cause housing inflation. Low interest rates suppress inventory because older homeowners who would often sell and downsize, or sell and rent when they reach retirement have no incentive to do so. Rather than cashing out and investing in safe CDs for income as they once did, many older homeowners now opt to hold on to their property as a rental investment. The conundrum for the Fed is that if they allow rates to rise enough to entice older homeowners to cash out, not only would this bring additional supply on to the market, it would suppress demand. The rise in monthly payments in a market where price to income ratios are already stretched to their limits would reduce the pool of qualified and willing buyers. Something would have to give. Either the market would grind to a halt if sellers tried to hold the line on prices, or prices would fall enough to keep purchases affordable as mortgage rates rise. The number of properties where the collateral value falls below the mortgage balance (under water) would increase. The damage to collateral values could lead to another financial crunch where the Fed had virtually no tools at its disposal to mitigate that. To the extent that the losses would fall to Fannie and Freddie, the losses would be borne by the US taxpayer either via the US Government direct ownership, or the Fed’s ownership of MBS. So the current housing market, with low inventory, rising inflation, and low affordability presents a gordian knot for policy makers. It is a knot of their own creation. They cannot untie it by allowing rates to rise because that would once again destabilize the system. By the same token, the status quo will only make house purchases less affordable for more people. Economic mobility will be suppressed as people remain stuck in houses in locations that may no longer present economic opportunity. The result will be the ongoing cycle of abandonment and community collapse that we have seen in all too many parts of America. Equally, if not more important, the new home development and construction industry will come under increasing pressure due to rising unaffordability. An industry that was a driver of US top line economic “growth” when the housing market was bubbling will cease to have any relevance at all. Where will those workers, who once earned high wages, turn. WalMart can’t hire everybody, and the $9 they pay won’t feed families. In the end, Fed policy of ZIRP can only lead to the ongoing degradation and dissolution of the US middle class. At some point that will be bad news for the financial markets. The party that those who have excess income and fictitious capital to speculate in stocks have enjoyed will be over. The realization of that may already be dawning on the stock market.